Sometimes, people harbor an irrational soft spot for cars they shouldn’t. When I was a kid, my mom really liked driving Chevettes. She had three or four of them over the years, and never had anything bad to say about the thrifty little runabouts. Now, at the time, I really hated them. I think they had air conditioning, but it never really worked. I think they had radios, but they never really worked. My dad used to glue old license plates under the carpet on a couple of them so your feet wouldn’t pop through the rusty floor Fred Flintstone style. 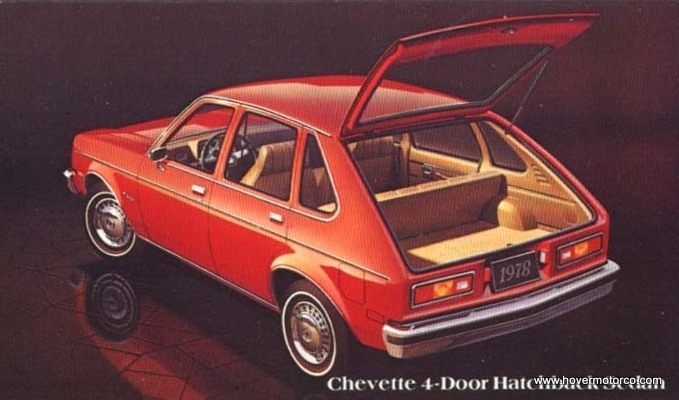 Her last one, an ’85 two-door, was still around when I started driving, and I remember that you could floor it going up gradual hills and it would lose speed. Sorry, Mom, those things were crap wagons. The automotive events and races are starting to trickle in a little more each week. Before long, we’ll have a full-blown schedule! A must-attend is the Mecum Collector Car Auction, which will be held in Bartle Hall Thursday through Sunday. You could buy a car there if you were so-inclined, but even if you don’t, it is one of the best car shows in town. See the entire lineup of car shows, cruises, and local auto racing, plus the NASCAR schedule from Martinsville, in the calendar below. 2013 Malibu Eco test drive and review. California, here we come! About 1,600 miles away from Kansas City is the beachfront city of Malibu, Calif. The affluent, picturesque community draws people in with its rugged bluffs, gnarly surfing, and tranquil drives along the famous Pacific Coast Highway. Obviously, the topography and beauty of Kansas City is a bit different. But even though we can’t fall to sleep with the sounds of ocean waves cascading on the sandy beaches, car aficionados know that good ol’ KC plays a major part in the Malibu legacy. We’re still a little early in the car show season here in Kansas City, but there are still a few things to do this weekend. The Weston Moonshiners start their 2012 cruises this Saturday, and several area dirt tracks are holding practice sessions. Plus, it’s supposed to be pretty nice out, so if you have an old car, it might be a good weekend to just get out there and drive it. As the summer rolls along, I try to do one of these calendars each week. 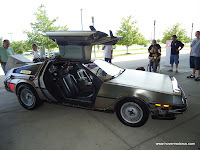 So if you have a car show or cruise in the Kansas City area that you would like to try and promote for 2012, be sure to drop me an e-mail at kcissclub@hotmail.com with all the information. See this weekend’s schedule, plus the TV listings for the NASCAR events in California, by clicking on the “Read more” link. Today is the anniversary of the death one of the most famous, and one of the most infamous characters in automotive history. On March 19, 2005, John Z. DeLorean died in a New Jersey hospital from a stroke at the age of 80. DeLorean had an incredible career in the auto industry. As the chief engineer of Pontiac, DeLorean gets the nod as the father of the GTO in 1964. Then he was promoted to the head of Pontiac, and cars like the Firebird and the Grand Prix were born during this time. The huge St. Patrick's Day virtual green machine car show. 385 pictures! This is the age of green cars. Hybrid, flex-fuel, hydrogen, and electric. Minimum comfort and space for maximum miles-per-gallon. Save the dinosaurs! Around here, green cars are, well, green. They’re hot rods, lead sleds, muscle cars, and trucks. They’re what you drive when you love what you drive. Our hybrids burn gasoline … and rubber. And anyway, the old ones really are green, because they haven’t burned through any new resources or energy associated with their construction since they were new. When the original Ford Taurus was introduced in 1986, it was a full-sized Ford sedan. The newly updated 2013 Ford Taurus is a full-sized Ford sedan. Aside from that, there’s little else comparable between the two cars. The role of Ford’s flagship has changed significantly in the last 27 years. And that is definitely a good thing—especially if your budget isn’t too tight. In 1986 alone, Ford sold more than 200,000 Tauruses. Over the years, it became one of the most successful selling vehicles in history. But it wasn’t perfect. The Taurus was always a good value for the money, but it wasn’t exactly a state-of-the-art luxury cruiser for most of its run. And remember the ovoid 1996-1999 version? Hideous. I am not even close to being a technophile, but I run into great car stories and pictures on the Internet all the time. Between the various blogs I follow, to Facebook, Twitter, and Google+, there is enough material out there to waste hours that I should be doing something else. I thought it might be fun to do a weekly column called the “Thursday Drive-By” where I pick maybe five stories that I hope you’ll like from various online sources, then providing the link for you to check them out yourselves. Of course, then I discovered that it takes longer to put all of this together than I was expecting. There’s just so much good stuff out there to choose from! Anyway, I’ll give it a try this week, and if you guys like the idea, maybe we’ll make it a regular, or at least semi-regular feature in the future. Check these out and see what you think! I’ve had the opportunity to drive lots of new cars over the years, and for the most part, the experience behind the wheel is pretty much what I expected. But every once in awhile, something comes along that catches me by surprise. 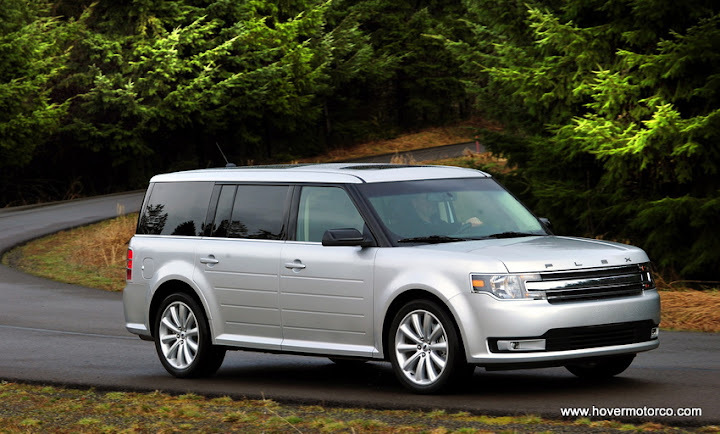 Such was the case with the 2013 Ford Flex. I recently went to San Diego for the 2013 Ford Taurus and Flex ride and drive. Actually, the updated Taurus was what I was there for—I sort of forgot that we were even driving the Flex until we got to the hotel and saw them parked in the line. You really don’t see all that many Flexes around, and they just aren’t the first thing you think about. Dean Weller is quite a guy. At 86-years-old, he is easily one of the most interesting people I’ve ever come across while working on this blog. The things he’s doing in his Southern Johnson County, Kan., shop are nothing short of amazing. There are so many little tangents this story can take, but let’s start with Dean himself. Dean was a home builder with a passion for old cars. He is also an incredibly talented artist and craftsman. And by "incredibly talented," I mean that he could probably make anything car related from scratch. Anything from the smallest piece to an entire car. Anything from a wooden wagon body to a smooth steel speedster. Seriously. Anything. The CARB Race-On Car Show during the annual Snake Saturday Parade is a North Kansas City tradition. What is not a tradition is the beautiful weather with which this year's installment was blessed. Normally, people are wrapped in blankets and parkas, and drinking coffee and cocoa. This year it was shirt sleeves and soft drinks. It has been a mild winter, indeed. I was recently told that the Greater Kansas City International Auto Show is the largest trade show-type event held in Bartle Hall each year. It's nice to know that there are still people out there who are interested enough in cars to pay to look at them. My boss asked me why I would bother to go take pictures of cars that you see everyday on the road. I guess there's some validity to that question. I mean, they had a grey Toyota Corolla sitting there and various other completely lackluster examples of bland, lifeless commuters. Of course, people buy this stuff for one reason or another, so they've got to be there. Something interesting caught my eye on the way to see The Lorax at the Legends Theatre. More on that in a minute. The Lorax is an animated movie that tries to deliver the message that it is bad to cut down trees for short-term personal gain, which is a nice message, I suppose. But then it turns its attention to the evils of big business and successful entrepreneurs. People should leave the environment alone, renounce large corporations and money, and live in a perfect utopia of cottony trees and adorable forest creatures under sun-drenched skies. Danny DeVito voices the Lorax, protector of the forest. The Brass Armadillo Antique Mall in Grain Valley, Mo., is big. We're talking 42,000 square-feet big. So if you're just going out there to look for automotive collectables, you're going to have a lot to sift through. But don't worry. I've done the work for you. I went there this weekend and found the good stuff ... the important stuff ... the car stuff. Living in the Midwest, we are certainly no strangers to the devastation tornadoes can cause. What we may not be used to is having them show up before the end of February. Tuesday night was definitely a bad night. 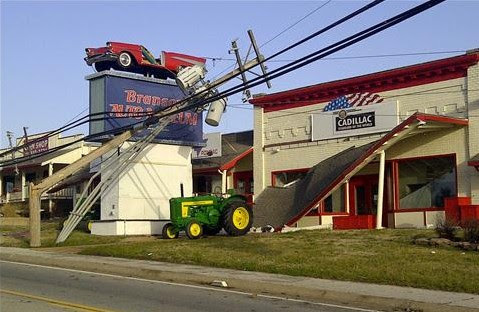 Deadly twisters ripped through Illinois, Kansas, and Missouri. The death toll is at least 13 people. Several more are injured. And the material damage adds up to millions.